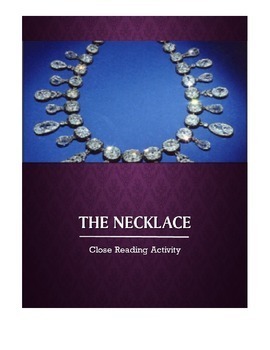 Have your students delving in to Maupassant's "The Necklace" with this close reading activity designed to be used with small groups with access to technology. First, students use their problem-solving skills to figure out how to convert French Franc to US Dollars, then translate that value into its modern equivalent so students can deepen their connection to the story. Next, students explore the symbolism of character names and street names in the story. 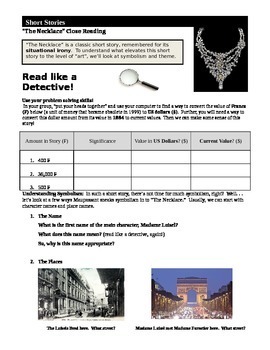 Also, students tackle the symbolism of the necklace itself before discussing Madame Loisel as a dynamic character. Finally, students explore numerous themes from the story. 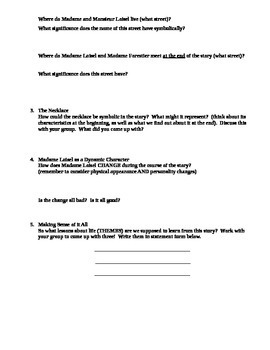 This activity includes teacher's notes at the end and a model student assignment which will help you lead your students to the correct answers on this flexible activity.